Challenge 2000 ran retreats for the Year 10 students at Saint Patrick’s College in Kilbirnie from Wednesday 14th to Friday 16thof November. These focused on the theme of social justice and raising the students’ awareness of this topic. It also helped the students to realise their own abilities to make a difference within their school and in New Zealand in general. The mornings were focused on introducing aspects of social justice and injustice to the boys. This included a long discussion on the need for equality in the world and incorporated the idea of poverty in New Zealand. To visualise this, Heath asked for ten volunteers to come up to the front of the group and showed them ten chocolates in a bag. The boys agreed that the fair thing to do would be to give each of them a chocolate. Heath then distributed the chocolates how the wealth of New Zealand would be in real life. This was met with shock when the last five boys had to fight over just one chocolate between them, while the first one had five to himself. It was great to see the chocolates then being shared around so that all had one. It made the boys think about the real life applications of the activity and the hardship that many face on a day-to-day basis. After lunch, the students got to get up and be involved in some fun activities. 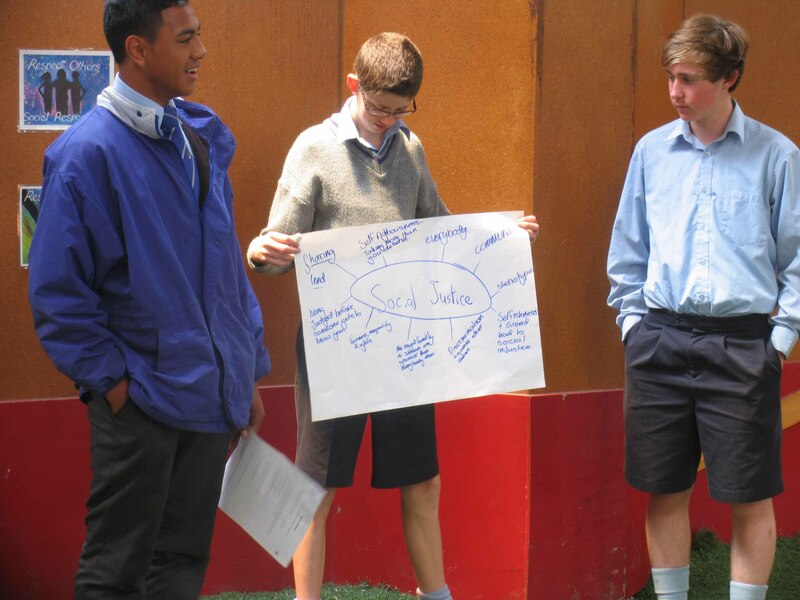 These activities focused on their team building, leadership, and communication skills, followed by some discussion on how aspects of social justice in the real world were reflected by how the boys handled the challenges they were presented. The days finished off with the groups coming back together for a calm and reflective liturgy before everyone dashed off to catch the school bus home. It was great to see the effort and willingness of the boys to participate in everything that was put in front of them, as well as the support they showed each other throughout the three days. Toia mai te waka nei, kumea mai te waka nei!